But first let's cut the foam to size if you didn't have the store do it for you. You want the bag to overlap the foam just barely halfway down the side of the foam block on each side. 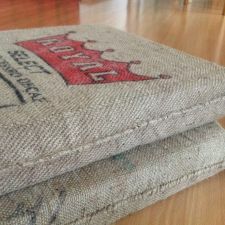 You can cut the foam with a sharp kitchen knife - don't worry if the cut is not entirely even or flat, the rough texture of the coffee bag will cover it up. Now comes the cool part: Stuff the foam block into the plastic trash bag. This makes the foam slippery and helps the bag slip over it. Next pull the coffee bag over the plastic bag. 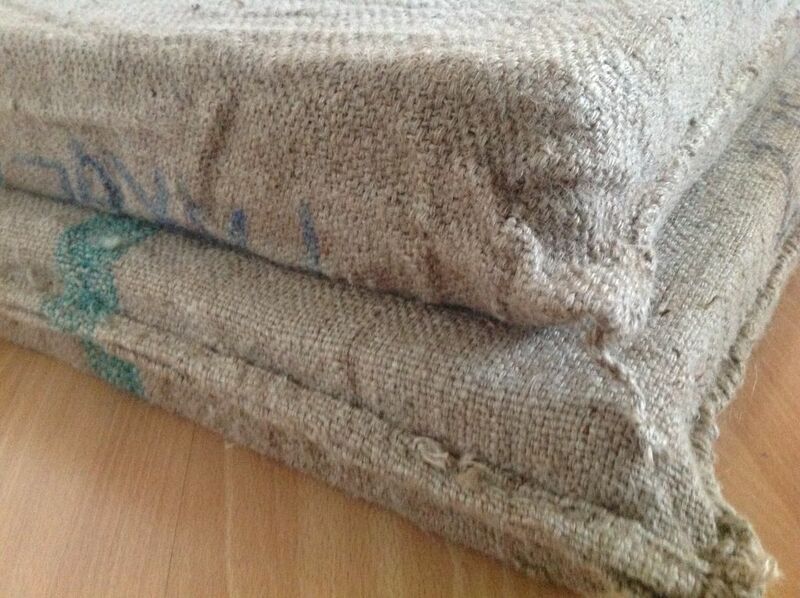 It'll still be a bit tight and require some work, but never like pulling jute over foam. 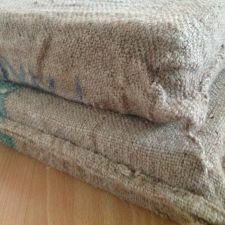 When the coffee bag is pulled tight over the foam, cut the plastic bag open down its side with a pair of scissors, being careful to not cut into the foam or coffee bag. Then retrieve all pieces of plastic. You can bend the foam in order to reach all the way to the bottom, no need to be afraid. 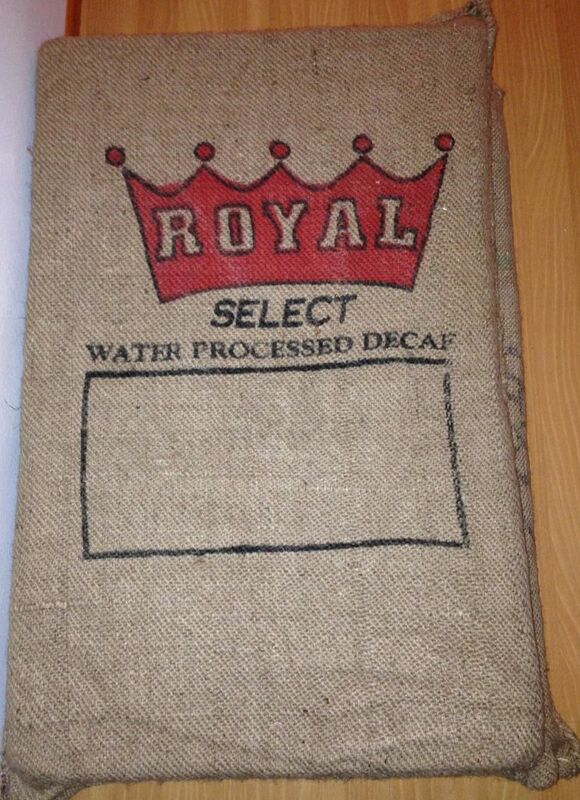 Finally, sew the coffee bag closed and clean up any loose threads and ends. 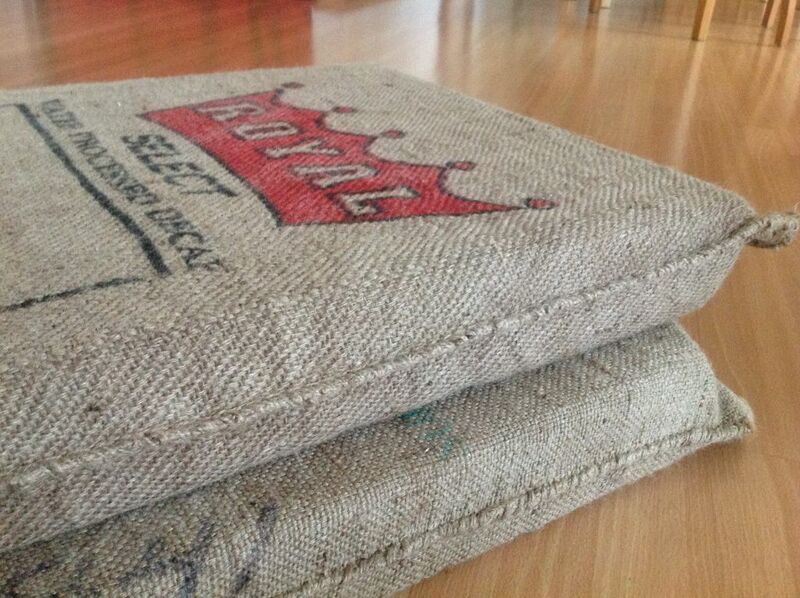 Enjoy your great new cushion! A closer look how the corners turned out. Note the tight fit, and cool texture and graphics. Submitted by danielandluci on Sun, 2013-07-14 00:33. We tried the same thing with a piece of memory foam but we put it into an old pillowcase. I like the coffee bag idea too though!